The Honour Roll commemorates those who enlisted from Frankston and served in World War One. The honour roll was provided by the Welcome Home Committee. The unveiling of the Frankston honor board took place on Sunday last. The ceremony was performed by Senator Brigadier-General Elliott, D.S.O., D.C.M., in the presence of a large and representative attendance. 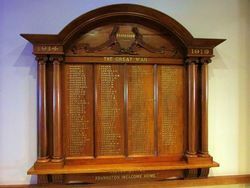 The honor board, which occupies a position in the main hall of the Mechanics' Institute; contains 153 names, and is quite a work of art. It is made of blackwood, being in the form of a canopy, supported by two pillars on either side. Underneath a carved wreath and scroll appear the names of the men who enlisted from Frankston. Cr.W. 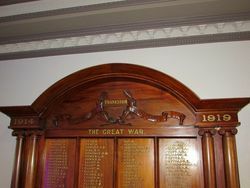 J. Oates, who presided, explained that the honor board had been provided by the Frankston "Welcome Home" Committee, which had from time to time organised socials in honor of the boys as they returned from the front. These functions had been a great success, and with the surplus money in hand the committee had provided the honor board. This was not to be the only record in Frankston, and in reminding the people of the handsome memorial which was to be erected in the main street, opposite the Post Office, he asked all to prepare to subscribe liberally to the memorial, which was estimated to cost between £13,000 and £14,000. After the Rev. A. P. McFarlane had read a passage from the Scriptures and prayer offered by Rev. C. Angwin, an eloquent address was delivered by Rev. D. Morris, B.A. Various hymns were sung with very fine effect, a combined choir being assisted by the Frankston orchestra, conducted by Mr. Prosser, senr., with Miss Prosser presiding at the piano. In performing the unveiling ceremony, Senator Brigadier Elliott said the duty devolving on him was a great honour and privilege. Referring to the men who had fallen he said that the sympathy of all went out at a time like this to the parents, relatives and friends of the men who did not return. Now that the war was over and the world seemed so little better, many, no doubt, asked themselves the question, "Was it worth while?" Possibly the disciples asked the same question nearly 2000 years ago, when our Saviour made the supreme sacrifice for mankind. The speaker considered that the leaven was working in the people, and instanced the great move now being made by the nations of the world at Washington. If as the outcome of that great conference the first step was taken to abolish war, then the sacrifice that had been made would not have been in vain. General Elliott then related many stirring incidents connected with the Great War in which members of the Australian troops had displayed marvellous feats of courage and self-sacrifice. At a later stage, General Elliot formally presented the war trophies allotted to Frankston, by the Victorian trophies committee. These consisted of two German machine guns captured during the Australian advance near Geneve, France, by the 24th Battalion, on 4th: October, 1918. Cr. Oates, on behalf of his cotrustees (Messrs. E. Barrett and J. Bradbury), accepted the trophies, and promised to guard and care for them as worthy mementoes of our boys wonderful achievements in the Great War. The chairman paid a tribute to the untiring work of Miss P. Twining, the hon. secretary of the welcome home committee, who had worked throughout with the utmost devotion; also to Mr. C. Tait, who had interested himself so successfully in securing such a magnificent honor board. Finally, the chairman thanked General Elliott for attending the ceremony. He was one of Australia's greatest soldiers, and his stirring address would live in the minds of the people who heard him as long as they live. Frankston and Somerville Standard (Vic), 23 December 1921.